Three of the most recognized letters in sport today are CTE, representing the brain disease, chronic traumatic encephalopathy. Dr. Bennet Omalu is the person most responsible for CTE having become part of the vocabulary of sports, especially football. If you have seen the feature film Concussion, watched the PBS documentary League of Denial or read the book of the same title, you are familiar with Dr. Omalu and with CTE. If you are a football fan you would be familiar with CTE from the numerous discussions of its relation to football that have appeared across a wide swath of the mainstream media. Truth Doesn’t Have a Side has several stories to tell, and they are told through a strongly religious lens. The hand of God is actively involved in Omalu’s personal journey and prayer is the key to overcoming the obstacles and problems, which are many. The first third of the book tells the story of Omalu’s birth and harrowing youth, his education, and his arrival in the United States for further education. The second section is the extremely gripping tale of how Dr. Omalu came to study the brains of former NFL players and how this turned into his quest and obsession while under attack by the NFL. 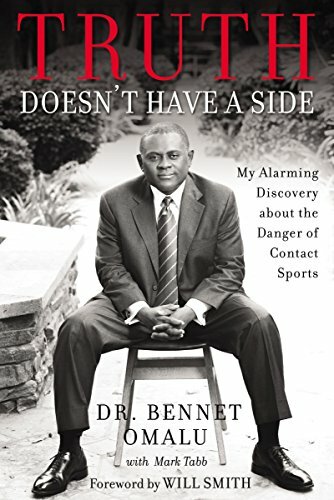 In the final section, Omalu seeks to reclaim his life and secure his place in the history of the discovery of CTE and its connection to contact sports. Born in Biafra during the civil war in Nigeria, Bennet Omalu and his family endured hardships during and after the war. His youth was marked by a lack of focus and low self-esteem. He was able to overcome these obstacles and ultimately earn a fellowship for advanced medical study at the University of Washington where his personal troubles continued. Then came a four-year residency at the Harlem Hospital Center, under the College of Physicians and Surgeons at Columbia University. In addition, Omalu underwent an extensive cultural adjustment in which his ideal America was replaced by the realities of American life, including those of being a black man in a white world. The heart of Bennet Omalu’s story takes place at the Allegany County medical examiner’s office in Pittsburgh. It was here in September of 2002 that Omalu performed an autopsy on former Pittsburgh Steeler All-Pro Center Mike Webster. The autopsy was straightforward, with heart attack as cause of death. Omalu did not know anything about Mike Webster, but as he learned the tragic story of Webster’s descent from hero to homeless bankrupt addict, he knew that heart attack was not the real cause of death. This led him to study Webster’s brain, and what he discovered there changed the conversation completely. Omalu’s recounting of this process and his feelings as he proceeded is fascinating. He was in disbelief, as were many others who saw the evidence from Webster’s brain, and subsequently other brain studies conducted by Omalu on former NFL players. However, those who worked for the NFL and those who regarded Omalu as an outsider who knew nothing of football or medicine dismissed his work. It was clearly a threat to the image of the NFL and possibly the future of football in America. Omalu was dismayed by the reaction of those who refused to accept his findings and their implications. The aftermath of the discoveries is rife with NFL attempts to counter the evidence, discredit Bennet Omalu, and destroy his career. It is also a story of battles over medical turf and grant money, which is a sordid, but fascinating, story. In the end, Omalu lost this battle and slipped out of the public narrative, but not before he left his mark on the public discussion of football and CTE. Omalu’s position is clear. Contact sports like football are dangerous, not because of the concussions, but because of the repeated pounding of the brain. No one should play football. Children under 18 should not be allowed to play football. In a society obsessed with football this is not a welcome view, especially from someone not born and raised in the football culture. In the end Bennet Omalu was unable to resist the opposition to him from the NFL, from others in the scientific community, and from those who regarded the work of an African and a black man as lacking credibility. Omalu presents an impressive case on his own behalf in Truth Doesn’t Have a Side. Much of his account is collaborated by Steve Farinu and Mark Farinu-Wada in League of Denial. On the other hand, they see some of Omalu’s problems as being of his own making and stemming from his naiveté. Bennet Omalu is obsessive over his findings, and it is clear that he does not understand the political and social forces that he challenged. He is certain that God is on his side, and therefore he cannot lose, a view that often wears thin on those around him. Despite that Bennet Omalu deserves credit for bringing CTE to the forefront. Every victim of CTE, in or out of football, owes him a great debt.